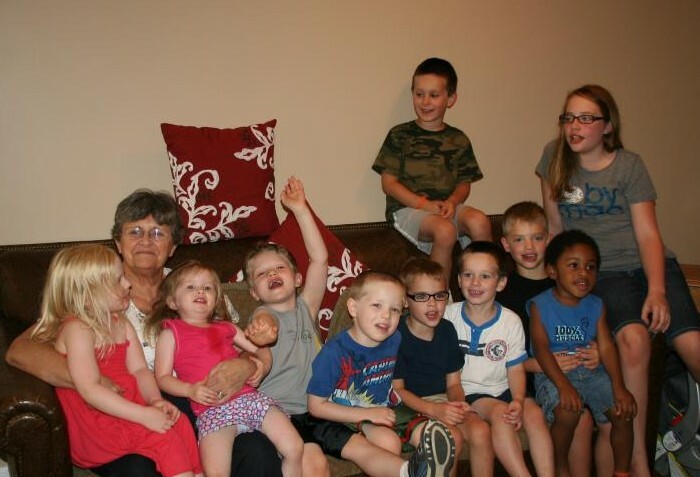 The Four Sisters Farm family gathered to honor my mom the night before her birthday...she is shown here with 10 of our grandchildren (the three babies were with their mommies)...she and Dad have 19 great-grandchildren now (number 20 is due this fall via a sweet niece of mine). I won't divulge the number of birthdays my mom has celebrated because you would never guess how old she is by looking (good genetics is the only explanation I have)...but I have to tell you how grateful I am for her. I am grateful that God gave her to me as my mother. I am grateful that she is still here on this earth. She is one of the most positive thinkers I have known in my life and she raised her children to look for the good in people and things. "Every cloud has a silver lining!" "If you can't say something nice, don't say anything at all!" "You catch more flies with honey than with vinegar!" (I am still trying to figure out why I would want to catch flies but you get the idea. You see, my mom has been ill since her childhood. She has a condition called bronchiectasis which was finally diagnosed after years of suffering from serious "colds" and fatigue among other things. When I was small, she underwent two separate surgeries to remove 2/3 of one lung and 1/3 of the other. As I grew up, the only tell-tale signs of her illness were the wide scars on her back and a distinctive cough. As time and each respiratory infection she battles take their toll on her, she relies more on medication and breathing treatments. It won't get better. It will get worse. From what I know, she never gave way to fear and didn't feel sorry for herself. She just took the lemons life had handed her and made lemonade. She refuses to be a victim. The prognosis given to her after her surgeries was that she probably would be fortunate to live to be forty years old. I told you I wouldn't tell you her age but I will tell you that she still has my dad (you know that I am over 50, right?). She has five children, 12 grandchildren, and 19 great-grandchildren (with another one due soon) and is enjoying life. She retired several years ago and is loving the time she has now to spend with Dad, to quilt, and participate in Bible studies and community events. She is a rock. She is often the voice of reason that resounds in my head. She is a magnificent role model for me, my siblings, my children and grandchildren, and so many others. I love her so much. I hope she celebrates a whole bunch more birthdays. I thank God for my Mom, today and always. Well...I am going to make you wait for just a moment. 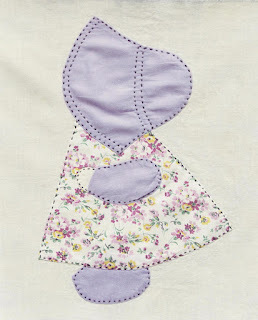 She was thinking about the sweet little "Holly Hobby" character she remembered from her childhood. There were dolls, toys, games, bedroom decor for girls, etc. Holly Hobby was everywhere! 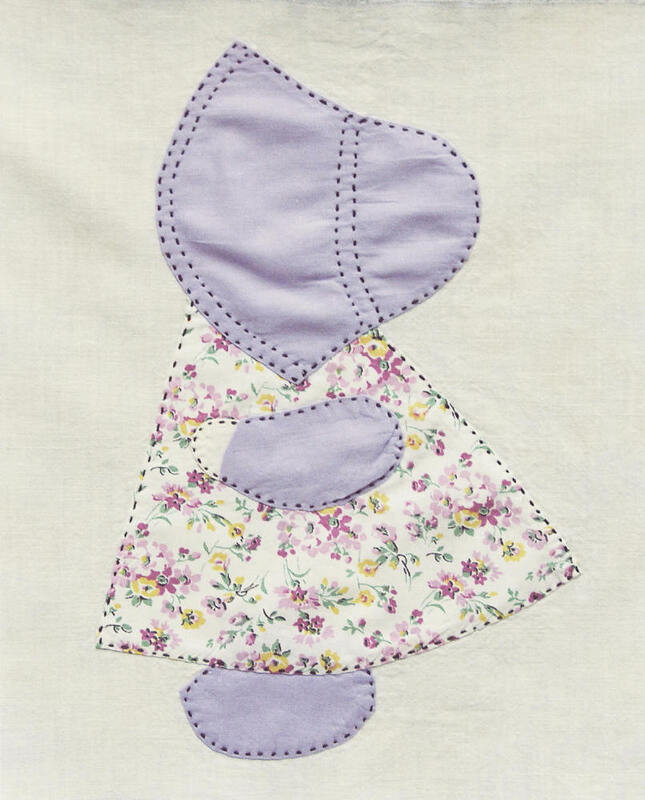 She said that the Sunbonnet Sue reminded her of "Holly Hobbit." I looked at her as the glee overtook me and said, "You mean like Holly Hobby but with big, hairy feet?" Bawahhaahaha!! Oh my! That's good stuff! I told her that misuse was blogworthy and she totally agreed. Enjoy! We have cats at Four Sisters Farm. They are a necessity in the country as they keep the rodent population controlled. Once they even killed a mole for us and brought it to the lawn for us to see. We were so proud. With wild (feral) and semi-wild as well as tame cats on our premises, there is a new litter of kittens once in a while. 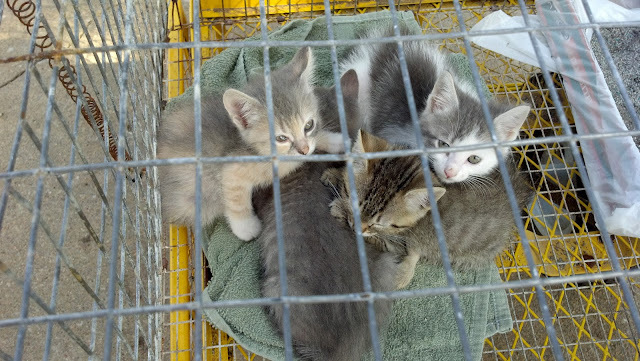 Recently, Pop discovered a litter of four that "Mama Kitty" was hiding in the pole barn. Of course we told the grandkids - especially Lou because she LOVES animals of all kinds, but has an intense fondness for cats. Pop and I like cats okay and truly appreciate them; but we feed a lot of cats at Four Sisters Farm...not enough to keep them from killing mice...but we feed them. So when the latest litter was found, Lou and I devised a plan to capture them when they were big enough. She began doing research and passing info along so we would be prepared. What we were NOT prepared for is just how sneaky, fast, and scrappy feral kittens can be! We worked hard and captured one. Only one. We told Pop about it and he came out to the pole barn to help us. Sure enough, semi-wild Mama Kitty had taught her babies how to hide and stay very quiet! But Pop moved some firewood and found them and helped us catch the remaining three. Fast forward now...past the kitty litter, scratches, and kitten chow. 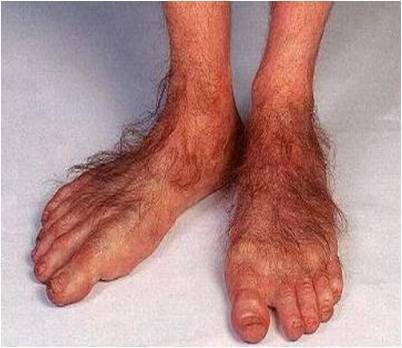 My plan was to keep them long enough to find a vet to fix them, then turn them loose. Well...we still have them. By day, they play in a large dog kennel and all the grandkids love to play with them. By night, they are moved to a smaller cage and wheeled via a wagon back to the pole barn for safety. But I am still not to the point; so hang on...one dark and stormy night (literally), I had the kittens in their play yard on the front porch and had been so busy I hadn't remembered to transport them back to their night spot. Pop and I decided to let them stay on the porch; but we hadn't accounted for their nocturnal naughtiness and noise...right outside our bedroom window...nor had we anticipated Mama Kitty's disapproval of our choice to deprive her sweet litter of their safe place for the night. So imagine trying to sleep with kittens jumping, playing, meowing, and their mother expressing her opinion LOUDLY. I threw on my robe and flip flops, grabbed my flashlight and made the transport. So, still not to the point. I know. Pop and I laid down and finally got to sleep...then Mama Kitty showed up on the porch again...like she had lost her mind and couldn't find her kittens. Pop reassured her that her brood was safely put to bed and came back in. Pop: "Do you think she could be smart enough to tell us there is a problem in the pole barn?" Pop: "Do you think I should go check on them?" I envisioned one of the little darlings stuck in the cage trying to escape and said, "Maybe." hoping that he would...and he did. There were actually no wrongs to right and no kittens to save. Pop is my hero just for being willing to come to the aid of four defenseless little kittens on the word of their somewhat confused mother cat. That is the latest reason Pop is my hero. And how I know you want to see the kittens. They are so cute!